There are a number of reasons why West Fork is one of the most popular trails on the Coconino National Forest. Once you've strolled beside the pleasant little stream that ripples along the canyon floor and looked up, way up, at the dizzying cliffs that tower above it, you will fall in love with it, too. West Fork is fantastic throughout the year. In springtime, migrating songbirds decorate the trees with flashes of brilliance. 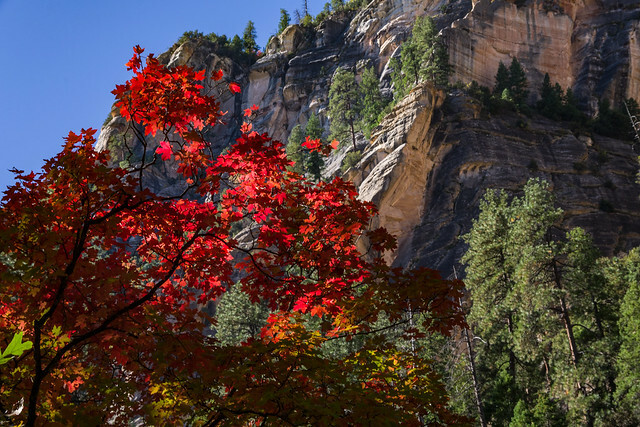 In autumn, the canyon is ablaze with color, with red and gold leaves floating in clear reflecting pools under a canopy of solid color. In wintertime, icicles decorate from red rock overhangs, and snatches of snow persist in cool shadows. As a matter of fact, you'll probably find a new reason to be here every time you visit. As for the trail itself, it's an easy stroll, but you do have to cross the stream in a number of places. Usually, that involves negotiating a few strategically placed stepping stones or taking a couple of steps in shallow water. The trail is marked and maintained for the first three miles. Many hikers explore beyond the end of the maintained trail. Eventually the pathway ends, the route becomes more strenuous, and you will be forced to hike in the stream bed as you continue into the Red Rock-Secret Mountain Wilderness. If you choose to travel the entire 14 mile stretch from one end of the canyon to the other, plan to do a lot of wading and boulder hopping, and even some swimming. Please read this notice describing the strenuous 14 mile long full canyon route between SR 89A to FR 231 (Woody Mountain Road) before attempting this rugged wilderness route. No matter how long a hike you take here, you'll enjoy it best if you come at a time when the trail is least crowded. Mornings and weekdays are best, better yet if they're in the off-season. When you do come, remember to take special care and leave this beautiful place better than you found it. Of course you know not to litter, but picking flowers and autumn leaves can cause just as unsightly a scar. So can short-cutting or rock throwing. Treat this natural treasure with the care it deserves and you'll have plenty of reason to come back and see it again and again. During summer, fall color, spring break, and other busy times of the year, Call of the Canyon (West Fork Trailhead) parking fills up every day by 9:30 a.m., seven days per week. Have a backup plan for a different hike or day use area if the parking lot is full. Parking along the road is extremely dangerous, and damages soils and vegetation. Passes: The Grand Annual Red Rock Pass is accepted here for entry to the site. The Every Kid in a Park 4th Grade Pass is accepted through 2018. Discounts: Access Interagency Pass (for people with disabilities) receive 50% off the entry fee. Annual, Senior, and other Interagency passes are not accepted. The West Fork of Oak Creek Trailhead and Call of the Canyon Picnic Area are operated by a concessionaire. This trail can become extremely crowded, especially on summer weekends. It will be closed during times of high fire danger, usually in late June. The West Fork of Oak Creek Trailhead (Call of the Canyon Picnic Area) is operated by a concessionaire. Location: 17.5 miles south of Flagstaff (9.5 miles north of Sedona) on paved roads in scenic Oak Creek Canyon. Access: Drive south 17.5 miles south from Flagstaff or north 9.5 miles from Sedona to about halfway between milepost 385 and 384. The trailhead is on the west side of the highway down a paved lane that leads behind a few creekside houses. Park at the Call O' The Canyon day-use area. The Call of the Canyon Day-Use Area is at the trailhead of the West Fork Trail. There are 6 picnic table sites; toilets; parking area for the West Fork Trail. Call of the Canyon is operated by Recreation Resource Management and is a fee area.